NETWORK FINALS: There were 0.1 bumps for SURVIVOR, CHICAGO FIRE and EMPIRE in final numbers. CABLE HIGHLIGHTS: FX’s AMERICAN HORROR STORY: APOCALYPSE led Wednesday cable with an 0.02 bump to 1.02. ESPN’s Lakers vs. Warriors NBA PRESEASON game was at 0.78, and the early game was at 0.37. Comedy Central’s SOUTH PARK gained 0.06 to 0.59. VH1’s BLACK INK CREW rose 0.07 to 0.56, and SAFEWORD was down 0.03 to 0.21. The latest hurricane boosted the Weather Channel throughout the day, led by the 2PM hour at 0.39. Fox News’s HANNITY topped cable news at 0.38/0.62/3.7M, with MSNBC’s RACHEL MADDOW SHOW at 0.33/0.48/2.9M, and CNN’s CUOMO PRIME TIME at 0.30/0.39/1.4M. Food Network’s GUY’S GROCERY GAMES edged up 0.02 to 0.31. On History, FORGED IN FIRE dropped 0.09 to 0.28, and KNIFE OR DEATH ticked up to 0.23. 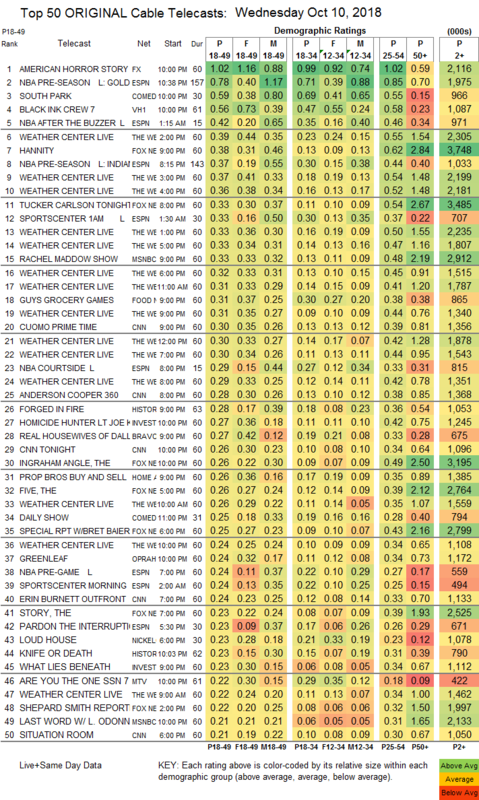 On ID, HOMICIDE HUNTER fell 0.11 to 0.27, and WHAT LIES BENEATH ticked up to 0.23. Bravo’s REAL HOUSEWIVES OF DALLAS gained 0.04 to 0.27. On HGTV, PROPERTY BROTHERS lost 0.03 to 0.26, HOUSE HUNTERS dropped 0.04 to 0.19, and HOUSE HUNTERS INTL was down 0.04 to 0.15. OWN’s GREENLEAF ticked down to 0.24. MTV’s ARE YOU THE ONE shed 0.02 to 0.22. FXX’s IT’S ALWAYS SUNNY IN PHILADELPHIA ticked up to 0.20. 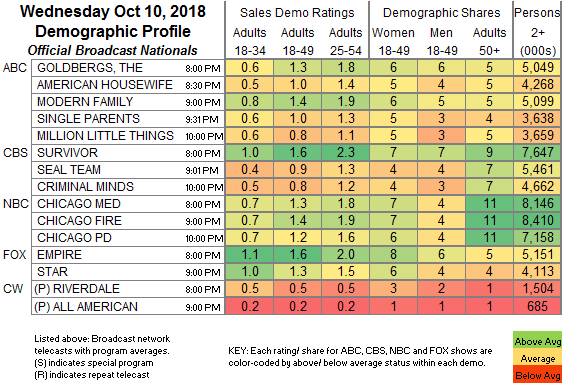 E!’s TOTAL DIVAS climbed 0.03 to 0.20. El Rey’s LUCHA UNDERGROUND was at 0.02/84K.